Travelling with too much Electronic accessory in case of losing and damaged??? Huge quantity of cables? Lots of small PC accessories? Take so much time to deal with when you go on holiday, travel or business? Don’t worry, Not a problem anymore. This portable electronics accessory storage bag fixed that. There’s a zippered see thru pouch, which perfectly fits extra battery pack. Thumb drives, or SM cards, can be stored there too, or under the netting on the other side. Then, your USB chords, or power adapters, are stored under the elastic bands that stretch across the middle of the pack on both sides. 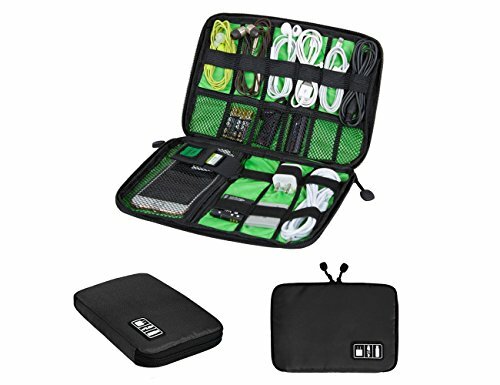 1* travel organizer case for electronic accessories. Made of durable, lightweight, heavy-duty and waterproof nylon material with well padded semi-flexible covers. Available in Black color, 100% brand new and high quality. Dimension: approx L8.9″ (22.5cm) x W6.2″ (15.7cm) x H1.4″ (3.6cm). Weight: 100g. The bag can be easily packed for fitting in Handbag and Backpack, convenient to carry. It can also be a great Makeup Cosmetic Bag or Baby Healthcare & Grooming Kit. Multifunctional design! Well padded semi flexible covers offer excellent protection for your accessories. The bags can effectively prevent them from dust, splash water, scratches and damage. Double zipper closure for more secure anti-lost guarantee! Comes with a handle for easy carrying when go outside. Perfect for businessmen, traveller or homeware use. Well Organize electronics accessory tidy and get easy access to reach. Buying without risk, 100% Satisfaction, 90-day Money back guarantee! Five Stars This is great it even fits my sp gameboy with games.